Surprise is the foundation of delight. Change the music and change the mood. What about transforming the vessel? Does altering the eating plane inspire a new meaning? A couple of Halloweens ago, I found myself pressured to make a choice. Either finish a quick bowl of spaghetti or join the group’s trick-or-treat stroll. Feeling suddenly resourceful, I nested dinner inside of a very transportable, 16 oz red plastic cup. We rounded corner after corner and bites slowly disappeared. This would not be the first time food has landed in a cup. The comic geniuses of Seinfeld threw in “pizza-in-a-cup” as a subtle irony in one episode. And street vendors for years plop fry order after fry order in a cone. Venerable ice-cream shops scoop gooey goodness into an edible vessel. And pioneers at Mighty Cone have translated the fish taco into an on-the-go meal. All fantastic inventions. But what about changing shapes to change perception? Some restaurateurs have pulled in the street fare presentation back into their dining room. Take for example the perfect hamburger at Nobhill Tavern. In this high-end meat and potatoes establishment snuggled in the MGM Grande hotel, Las Vegas, Michael Mina presents America’s classic as part three star, part three ring entertainment. Robert Del Grande, RDG in Houston, TX, also lays out the burger and fries similarly. These and other chefs have taken a different direction. Instead of playing with shapes for utility, they are triggering a mental image from our past. They sync their updated presentation with our own history. Carefully unite the now and the before for optimal effect. From the pleasure of a youthful self to the elegance of an adult who can afford a $20 hamburger, these chefs are constructing a happy event in our minds. So let’s play with expression through changed context. Spaghetti in a cup opened new ideas of transportation. And transportability devices disrupt our sedentary experience of dining. What else can you say? At Pesce, Houston chef’s Mark Holley re-invented the shellfish salad by hoisting succulent scallops, crab, and shrimp some 6 inches off the table through an over-sized martini glass. They play the pun by presenting a seafood cocktail in a namesake glass. Why not do the same with pestoed pasta? 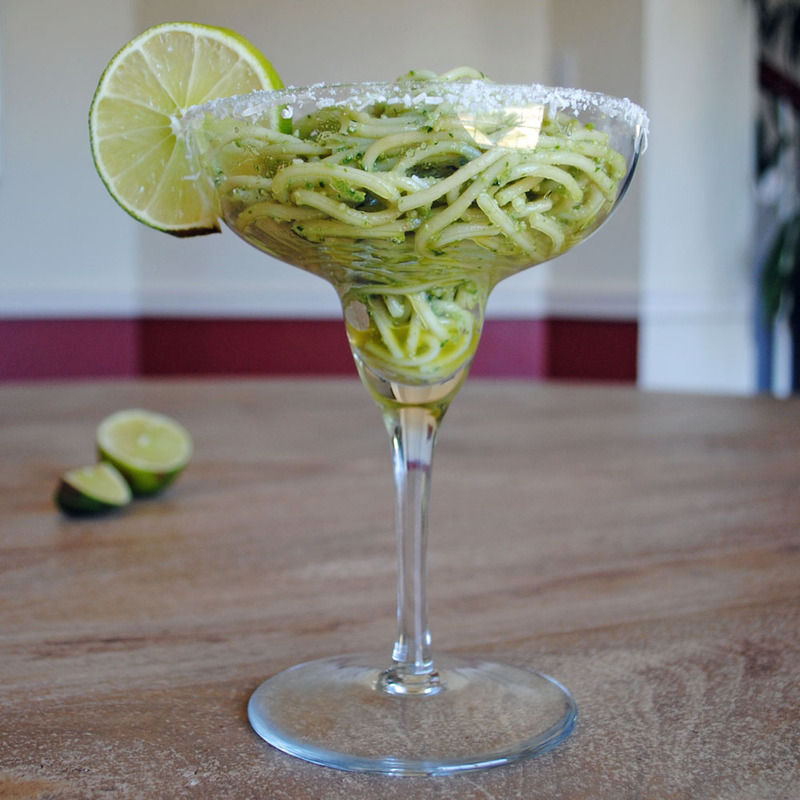 Seen at the top of this post is a swirl of spaghetti dressed in a poblano-lime pesto levitating in a parmasean-lined glass. Part of the intellecutal tension is the fact that while vessel tells you to drink, your mind already knows that gravity would have this in your lap at first sip. So what we’ve been trained to do (drink from glasses) is turned upside down: we eat from them instead. Consider the presentation of sauced pasta in a tea cup. Here the ruddy color of the dish and delicate bone china all signal a drinkable moment. However closer inspection suggests chomp not slurp. The tea party artifacts (the creamer and the sugarbowl) help to cement the tea event in our minds. However the substitution of physically similar ingredients (cheese, not sugar) plays peek-a-boo with our intellect. It is visual pun which has us guessing like how M.C. Esher‘s staircase always seem to go down. Or is it up? Go another step further and put dinner in an entirely new place. 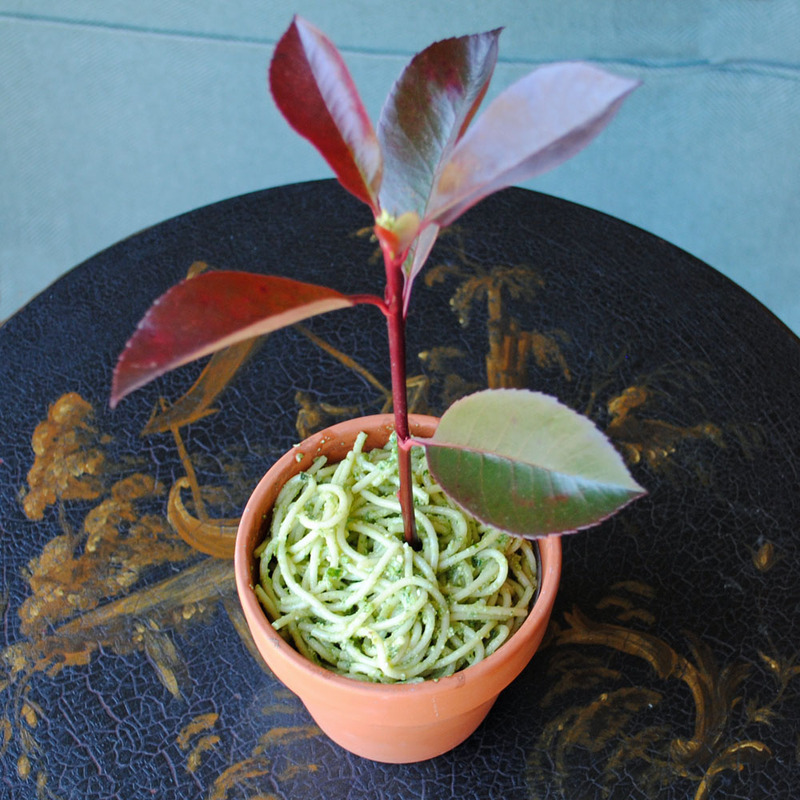 Pictured below is the same green pasta in the comfort of a clay pot. By moving the pot to the side table and plopping a sprout in the center, we have carefully crossed the line between that which is desirable to eat and that which is curious to see. At a different event like a garden party, this dish with an edible purple-basil in it’s center would be much closer to normal. The diner would no doubt reach for the fork first and not the camera. Now take the edible vessel. Chefs have brought us soup in bread bowls and salads in taco shells. Why not turn the tomato into a pasta cup? Certainly more familiar and yet with a dash of irony. Most of the time, pasta nearly swallows tomato absorbing sauce into starchy strands. In this edition the tomato, forms the architecture for the pasta, giving it structure and intrigue. This is not your grandmother’s pasta dish. It’s a re-invention of the familiar. Now that our play time is done. Wherever shall we store this play-dough? Back in the jar for another day. This time color pasta lays in sedimentary layers like some fancy bottle of vegetable preserves. Even in storage we can change our perspective AND get a bit of utility in the process. What else do you think is possible? Send in your comments. Share your ideas. Let’s change the world, one bit at a time.